This article is about the symbol. For the tennis player, see Henry Prusoff. The Russian Bear is a widespread symbol (generally of a Eurasian brown bear) for Russia, used in cartoons, articles and dramatic plays since as early as the 16th century, and relating alike to the Russian Empire, the Soviet Union and the present-day Russian Federation. 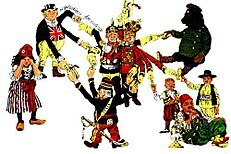 It often was and is used by Westerners, originated in British caricatures and later also used in the United States, and not always in a flattering context – on occasion it was used to imply that Russia is "big, brutal and clumsy" (see 19th-century cartoon below). After the collapse of the Soviet Union, there was some support in the Russian Parliament for having a bear as the new Russian coat of arms – with the proposers pointing out that "Russia is anyway identified in the world with the Bear" – though eventually it was the Tsarist-era coat of arms of the Double-headed eagle that was restored. Later, the bear was taken up as the symbol of the United Russia Party, which has dominated political life in Russia since the early 2000s. Coincidentally, the surname of Dmitry Medvedev, the Russian president elected in 2008, is the possessive adjective of медведь: i.e. his surname means "bear's". In his successful 1984 re-election campaign, Ronald Reagan used the bear motif in the famous "Bear in the woods" ad, which claimed that he recognized the existence of a Soviet threat, and that his opponent denied its existence. Russian amateur wrestler Aleksandr Karelin has also been nicknamed the "Russian Bear". Banner depicting the Russian Bear unfurled by Russian football supporters (the inscription says "Go ahead Russia!"). The Russian Bear (sitting, to the right) among the European powers courted by Bismarck in order to isolate France. Cartoon from the English satirical magazine Punch, or The London Charivari. 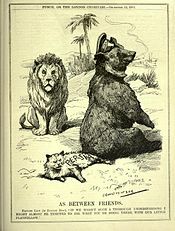 With the Russian Bear sitting on the tail of the Persian cat while the British Lion looks on, it represents a phase of The Great Game. The caption reads: "AS BETWEEN FRIENDS. British Lion (to Russian Bear). 'IF WE HADN'T SUCH A THOROUGH UNDERSTANDING I MIGHT ALMOST BE TEMPTED TO ASK WHAT YOU'RE DOING THERE WITH OUR LITTLE PLAYFELLOW.'" 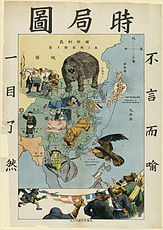 Newer version of THE SITUATION IN THE FAR EAST, with a bear representing Russia intruding from the north, a bulldog representing the United Kingdom in south China, the Gallic frog representing France in southeast Asia, and the American eagle representing the United States approaching from the Philippines. 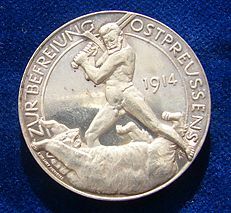 The reverse of a World War I German Silver medallion liberation of East Prussia 1914 by Paul von Beneckendorff und von Hindenburg. Referring to the Battle of Tannenberg. The naked General Hindenburg fighting the Russian Bear with his sword. ^ "Aleksandr Karelin, Wrestler, Law-maker and More". Voice of Russia. 25 March 2009. Retrieved 21 August 2014. For the Russian bomber codenamed Bear, see Tupolev Tu-95. Rossomakhin, A.; Khrustalev, D. (2008). "Russia as a Bear: origins of the visualization (16th–18th centuries)" (in Russian). IvSU. Rossomakhin, A.; Khrustalev, D. (2008). 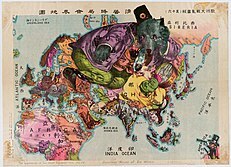 "Russia as a Bear". Neprikosnovennyy zapas (in Russian). 1 (57). Archived from the original on 2011-07-23.